Abhik Singla, Shounak Bhattacharya and Dhaivat Dholakiya are with the Robert Bosch Centre for Cyber-Physical Systems, IISc, Bangalore, India. Humans and animals are believed to use a very minimal set of trajectories to perform a wide variety of tasks including walking. 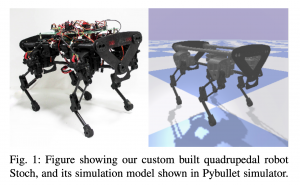 Our main objective in this paper is two fold 1) Obtain an effective tool to realize these basic motion patterns for quadrupedal walking, called the kinematic motion primitives (kMPs), via trajectories learned from deep reinforcement learning (D-RL) and 2) Realize a set of behaviors, namely trot, walk, gallop and bound from these kinematic motion primitives in our custom four legged robot, called the `Stoch’. D-RL is a data driven approach, which has been shown to be very effective for realizing all kinds of robust locomotion behaviors, both in simulation and in experiment. On the other hand, kMPs are known to capture the underlying structure of walking and yield a set of derived behaviors. We first generate walking gaits from D-RL, which uses policy gradient based approaches. We then analyze the resulting walking by using principal component analysis. We observe that the kMPs extracted from PCA followed a similar pattern irrespective of the type of gaits generated. Leveraging on this underlying structure, we then realize walking in Stoch by a straightforward reconstruction of joint trajectories from kMPs. This type of methodology improves the transferability of these gaits to real hardware, lowers the computational overhead on-board, and also avoids multiple training iterations by generating a set of derived behaviors from a single learned gait.